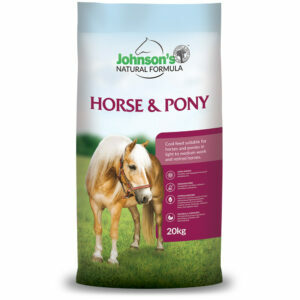 Well balanced, highly digestible & palatable feed designed for old and retired horses. 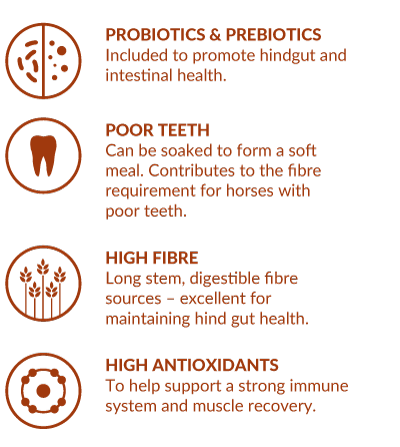 High in fibre, low in starch and contains targeted ingredients for optimal gut health and support. 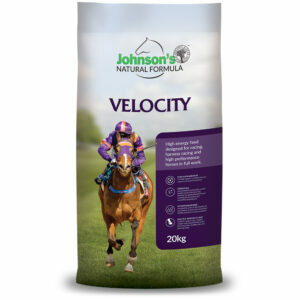 Johnson’s Old Timer is a scientifically balanced, grain free feed, high in fibre, low in starch designed for old, retired and sensitive horses. 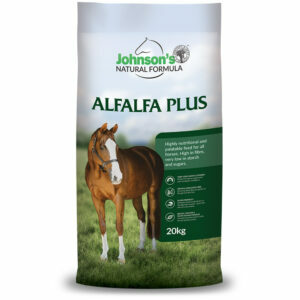 Containing probiotics and prebiotics in a highly palatable pelleted form makes it perfect for horses with digestive disorders or sensitive stomachs. Delivers slow release energy, for horses and ponies in light and medium work, and retired or spelling horses. Can be soaked into a soft mash for horses with poor teeth. 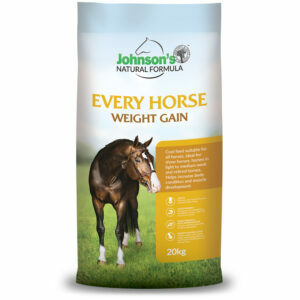 Introduce any new feeds into your horse’s diet gradually over a 1-2 week period. Designed to be fed in conjunction with roughage such as pasture and hay. May be fed either wet or dry, alone or combined with other ingredients (eg. chaff or grains). Horses should receive a minimum of 1% of their body weight in roughage per day. The suggested feeding rates are a guide, and the amount required will vary depending on the quality and quantity of pasture and hay available, stage of training, exercise intensity, body condition and metabolism of your horse. Divide into smaller feeds if feeding over 0.5kg per 100kg of body weight per day. Ensure your horse always has access to clean water. 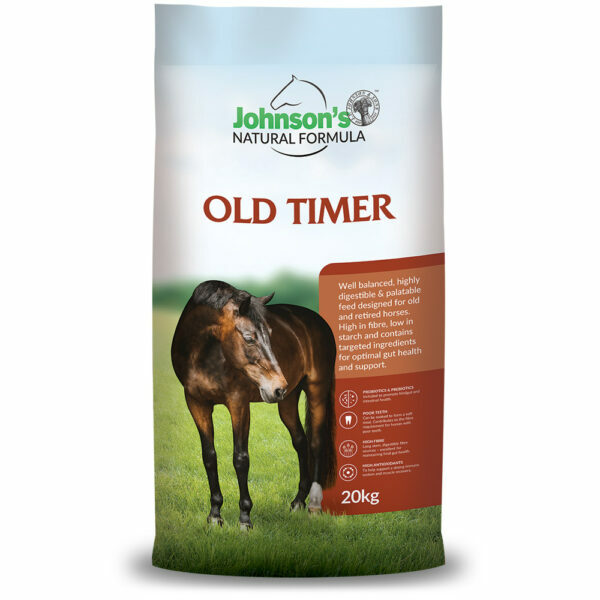 Johnson’s Old Timer contains premium grade export quality Oaten Hay and Lucerne Hay, Lupins, Faba Beans, Full Fat Soybean (GMO free), Soybean Oil (GMO free) and Johnson’s Premium Vitamin and Mineral premix (including chelated minerals, prebiotics, probiotics, and mycotoxin binder). This product does not contain restricted animal material. This information is intended to be used as a guide only. It is a condition of use of all or part of this information that no liability will be accepted by Johnson’s Natural Formula or JT Johnson & Sons for any loss that may arise, financial or otherwise, from relying on this information.